The HootSuite dashboard is loaded with features and tools to help you make the most of your social media management… and we’re always adding more. With so many ways to use HootSuite, even advanced Owls may need a refresher, so here’s a new #HootTip all about a handy HootSuite feature. Are some of your co-workers not using Twitter? Want to forward an interesting Tweet to a friend or colleague? Or perhaps get your relatives excited about social web. 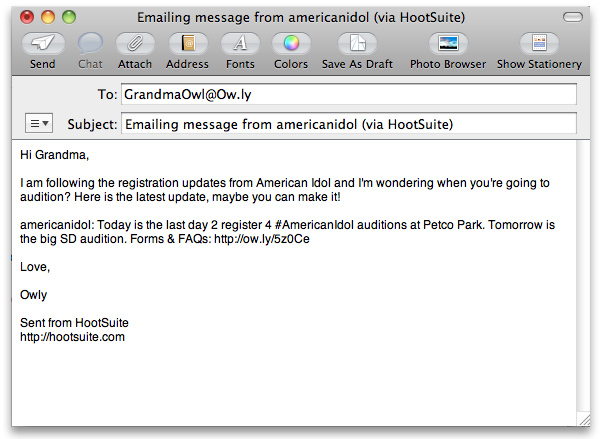 Use HootSuite’s “Send to Email” button for a handy way to bring them into the conversation. This “Send to Email” button will automatically paste the selected Tweet into the body of your email, plus you can also add notes before sending. 1) Hover over a status update in one of your streams and click on the drop down menu. 2) Click the “Send to Email” button – The dashboard will then access your default e-mail program and add the selected Tweet into the message along with the “Sent from HootSuite” signature to provide context. These buttons couldn’t be easier to use! Give these shortcuts a try the next time you’re responding to or sharing Tweets.